Synopsis: Deep in the heart of Oxford’s Bodleian Library, scholar Diana Bishop requests a manuscript called Ashmole 782 in the course of her research. 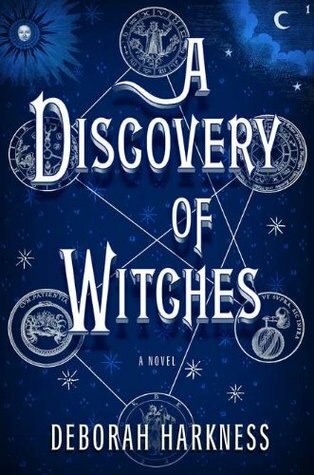 Coming from an old and distinguished lineage of witches, Diana senses that the ancient book might be bound up with magic – but she herself wants nothing to do with sorcery; and after making a few notes on its curious images, she banishes it quickly back to the stacks. But what she doesn’t know is that the old alchemical text has been lost for centuries, and its sudden appearance has set a fantastical underworld stirring. Soon, a distracting horde of daemons, witches, and vampires descends upon the Bodleian’s reading rooms. One of these creatures is Matthew Clairmont, an enigmatic and eminent geneticist, practitioner of yoga, and wine connoisseur – and also a vampire with a keen interest in Ashmole 782. It was really well-written and there were parts where the style was beautiful and almost poetic, but it was just way too long. This book is almost 600 pages and I felt like I waited the first half of the book for something - anything - to happen, and then even when stuff started happening, there was so much filler in between that it felt like I was still actually waiting for something to happen. The concept was good - different, and interesting - but in my opinion, the author failed at the execution. It was overly detailed - at one point (about a dozen times after she'd said it), I felt like counting how many times she mentioned Matthew's 'cold, white fingers', and I don't think we needed to know every single detail about every room she entered, down to the furniture and colour of the walls, or a detailed description of every move she made and thought she had. If the author had taken everything interesting that happened and condensed it into a book that was 200-300 pages, I might very well have given it 5 stars. From where I ended it (page 453), I would have given it 3 stars. I got the book back on August 24th and read the remaining 126 pages that night. It was starting to get interesting when I had to return it, and it did get better in the last 126 pages - so much so that I’m anxious for the next book in the trilogy. If I were basing the review on the latter part of the book, I’d give it 4 stars. I loved the characters – the main ones and the minor ones. That’s one thing about a super-long book, you get time to really know the characters and see them develop. I really liked the relationship between Diana and Matthew, and I loved Matthew (a vampire), even though he was bossy and controlling – old habits die hard when you’re as ancient as he is (I won’t say how old he is because I enjoyed finding that out on my own, and I’m sure others will, too). I love the way he takes care of Diana and fusses over her. Diana is impulsive and stubborn, which makes Matthew all the more protective. I also love the Bishop house where Diana’s aunts Sarah and Em live. Coolest house ever – that’s all I’ll say about that. Another of the things I didn’t like was all the parts about history and alchemy. A basic overview would have been interesting, because they are interesting subjects, but she went too in depth and it got confusing and made me wish I was better at skimming. Very helpful review. I have my eye on this book because of the alchemy and witchcraft aspects, so by telling me that this is a big part of the book you've actually increased my interest. thanks for the review. i think i'll avoid this one. I spotted this book on the shelf in our local bookstore (yes, we only have one). It really caught my eye, but I'm thinking, after reading your review, that I'll leave it alone for a bit and tackle some of my other 'eye-catchers' first!